Many thanks to Ellena and Maureen, they have been organising monthly makan gathering for foodies and twitter friends. 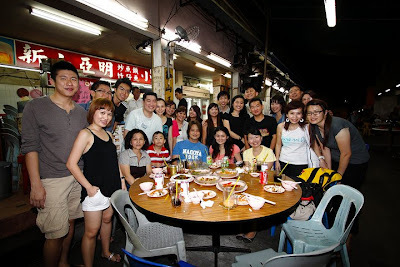 This month we headed to Geylang for Zi Char at JB Ah Beng. The ten course dinner started with the Fried Fish Skin served with green papaya and sweet chilli sauce. The fish skin was crispy and not oily. I felt that the dish lacked a bit of saltiness. Probably some salt could be sprinkled on the fish skin or provided salty based sauce instead. There was a little commotion among us when the Stewed Chicken with Liang Fen was served. Everyone was wondering how the Liang Fen looked and tasted like which was hidden underneath the plateful of chicken and mushroom. Some said it tasted like Soon Kueh skin while others thought it tasted like Chee Cheong Fan skin. Nevertheless it was very tasty soaking up the delicious gravy of the stewed chicken. Next was the Fried Fish Head. The stall used red snapper fish head for the dish. It was chopped into pieces and stir fried with spring onion and ginger. An enjoyable dish that will go very well with beer. The San Lou Bee Hoon is one of JB Ah Beng's popular dishes. Do not be mislead by the plain looking plate of Bee Hoon. Hidden and sandwiched by the Bee Hoon was a layer of greens which gave the dish a little surprise and uniqueness. Simple but very good. The Baby Bok Choy with Tofu and Mushrooms had the thumbs up from all of us. The soft and smooth tofu melted in the mouth as well as my heart. For people that do not like to eat brinjal, this dish may change your opinion. The brinjal was coated with batter and fried with potato cubes and green capsicum. If I am blindfolded, I probably could not tell that I was eating brinjal. I love fermented beancurd and I was looking forward to the dish. However I was disappointed as I could not taste the fermented bean. The pork belly was also thinly sliced and dried. The Snake Beans with Lotus Root was my favourite vegetable dish for the night. The snake beans or commonly known as long beans had a nice crunchy texture. The deep fried lotus root was also very special. It felt like I was eating potato chips. There are many versions to cook crabs but the White Pepper Crabs at JB Ah Beng is a best try. Only three words to describe it. "Finger licking good"! The Salted Egg Prawn Ball was supposed to be one of the other popular dishes but it was a disappointed. I applauded the concept but it turned out dried and hard. To get her, alight at Aljunied MRT station and take 5 minutes walk towards Geylang Lorong 23.